If you are growing your palm tree in pots you can easily grow them indoors over the winter months. Be sure to give them as much light as is possible inside your home and keep them a little on the dry side. If you do not have room for them inside of your house but you have a cool garage or shed, you can easily store them inside of it over the winter. We recommend a thick layer of mulch (3-6″ away from the base of the palm), no matter which method is used. Do not cut back the leaves or cut down the palm. Place 4 stakes about 3 ft apart in a square pattern, leaving the palm in the center. Place 1 to 2″ chicken wire or fencing wire around the posts forming a 3ft x 3ft square basket. The chicken wire should be about 3 to 4 ft high. Fill this basket with leaves until full. Now the palm tree is protected from the hard winter frosts but is still able to breathe properly on those nice sunny winter days. Early March is a great time to remove the leaves and your basket and the palm tree is ready to grow. The leaves can take frost up to minus 10 C, if colder weather is expected the simplest way to protect the leaves is tying them together in one tall bundle and then wrapping the bundle with one string of old fashioned Christmas lights. When the lights are turned on the heat of the bulbs is enough to protect your tree. **LED lights will not work. 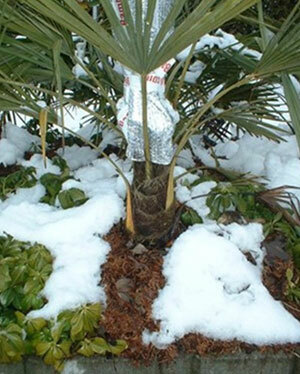 Cover the soil above the Palm trees with mulch to protect the roots from hard freezes. Wrap the center spear and the first three to six leaves with water pipe insulation. Be sure to fold the top over to make sure that no water gets inside the insulation. In the spring remove the plastic and mulch and watch it grow back very quickly. 1) Pull up the fronds and tie them back. A simple rope or flexible tie-up material (such as old pantyhose) can be used. 3) Wrap the trunk with 3 to 4 layers of burlap making sure to tie it back with duct tape. Make sure that the thermostat for the heat tape is on the outside of the burlap. Wrap the whole trunk including the fronds. 4) Once the trunk has been wrapped with burlap, re-wrap the trunk with plastic or shrink wrap (shrink wrap is the easiest to use and can bought at any stationary store). Make sure to wrap the entire palm including most of the fronds. 5) Once all of the above steps have been completed then plug the heat tape in and you are ready to go. The tape will only work when the temperature drops below freezing and will be enough heat to protect your palms for the winter months. Caution: Make sure to plug only into a ground fault receptacle and too only wrap your palms before the cold weather begins (in Vancouver this is usually the middle of November) and remove it just before the weather warms up (in Vancouver this would be February). If the wrapping is left on to long you risk rotting the plants in the warmer weather of spring.